During the first lessons in ground work you establish your positions. You learn to place the horse on a suitable distance using your body language in combination with the whip. In addition, you want to make the horse follow you around the circle, so that it neither slips outwards or takes a short cut. Your first ground work lesson is about to start, but how are you supposed to do it? Start with some leading exercises to feel you and the horse are listening to each other. Then you stop the horse and stand in front of it. Ask the horse to lower its head. Start walking backwards on a circle together with the horse. Just as you have started and stopped simultaneaously in the leading exercises, you want to do it in the ground work. However, the position in ground work is more stopping than the one in the leading exercises since you are standing in front of the horse. If the horse thinks this is a bit odd, then just urge it onwards and ask it to follow you. A little tidbit might do wonders. When you start walking backwards, you might realise the horse easily slips outwards from the circle and make it bigger, or maybe it cut corners to reduce the circle? Maybe it is difficult to maintain a suitable distance to the horse? Is the horse falling behind or is it maybe in a hurry and even push into you? A little tidbit might do wonders. You want the horse to follow your body, just as you are used to from the leading exercises. To facilitate this you may change your position, from having the horse a bit on the outside to having it right in front of you, head pointing towards your stomach. Then start walking and get the horse to follow your body. The most important thing is for you to find a suitable distance from each other. If the horse constantly pushes into you, you´ll lose balance and then you can´t work, and the same thing goes for a horse falling behind that you feel the constant need of pulling along. Use the whip on the chest, under the neck, to make the horse stop and use the whip in the leg aid area to get it to hurry up. In ground work it is important to keep the distance between human and horse. The distance may be 1 cm or 2 m, as long as both of you respect it and don´t push into each other. In ground work, it is important to keep the distance between human and horse. The distance can be 1 cm or 2 m as long as both of you respect it and don’t push into each other. Just as in the leading exercises the rein hand has nothing to do with speed control, ie you neither pull the rein to stop the horse or pull the horse along if it is too slow. 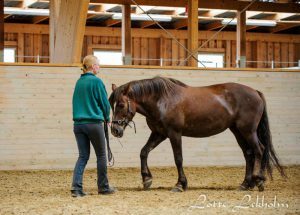 If the horse, despite a whip aid in the leg aid area, does not speed up, then turn around to leading exercise position and walk along the horse for a few steps, and then slip back into ground work position and praise your horse a lot when joining you. If the horse is cutting corners and reduce the circle size, lift the whip and tap it against the inside shoulder, and if the horse is sliding outwards and increase the circle, you place the whip under the neck and tap the outside shoulder. The first ground work lessons are essentially leading exercises where you walk backwards! Practice by stopping together, ask the horse to lower its head, and start together, many, many times. Stop the horse and ask it to lower its head. Find a suitable distance to each other and maintain it using your body language and whip. Shape the horse according to the circle. The whip on the inside shoulder prevent the horse from cutting corners and the whip placed under the neck on the outside prevents the horse from sliding outwards.